As of today, still no change to the project. Still no bike lanes. I've been talking to anyone I can: State & Local elected officials, press, etc. But here's the latest information for your perusal. Memorandum of Understanding signed by Sandy Springs & GDOT in October, 2012, total project budget is $10.5M. The GDOT-provided numbers total $9.2M, indicating that there appears to be room in the budget to add bike lanes on both the bridge and Roberts Drive within the project area. 2010: $1.2M -- North Fulton CTP, Project VH208: Provide capacity and operational improvements. Public Meetings: Single one held on December 4, 2011. "The new bridge will include minimum width bike lanes in both directions." SRTA took in $20M from the GA-400 Tolls in FY 2012. Sandy Springs FY2012 Revenue was $95M, with a balance of $70M. Why Build Bike Lanes on the Bridge? Was in the original plan from 2010. Can’t Afford Not to: Bicycle Accommodations add value to local businesses & homes. Improve Health, Increase local transportation options. All add up to an excellent long-term Return on Investment. Safe Routes to School: Two Elementary Schools within ¼ mile of the project. Allow parents & children a SAFE transportation option, relieving local motor vehicle rush-hour traffic. Plan for the Future: Bridges last 50+ years. Gen X/Y are looking for walkable, bikable communities & will relocate their businesses & create new jobs where this infrastructure exists. This trend will increase. Regional Connectivity: This bridge is the single point of access between Perimeter CID, Dunwoody, Sandy Springs to cross the Chattahoochee River into Roswell, connecting into their trail & bike network and points beyond. Supports Existing Plans: Sandy Springs 2008 Transportation Plan identifies Roberts Drive/Northridge as a north-south Bicycle Corridor. Roswell & Sandy Springs have budgeted and are building a Bicycle/Pedestrian Bridge acrossthe Chattahoochee at Hwy-9/Roswell Rd (completion: 2016). Dunwoody has built Bike Lanes northward along Roberts Drive to the Sandy Springs border. 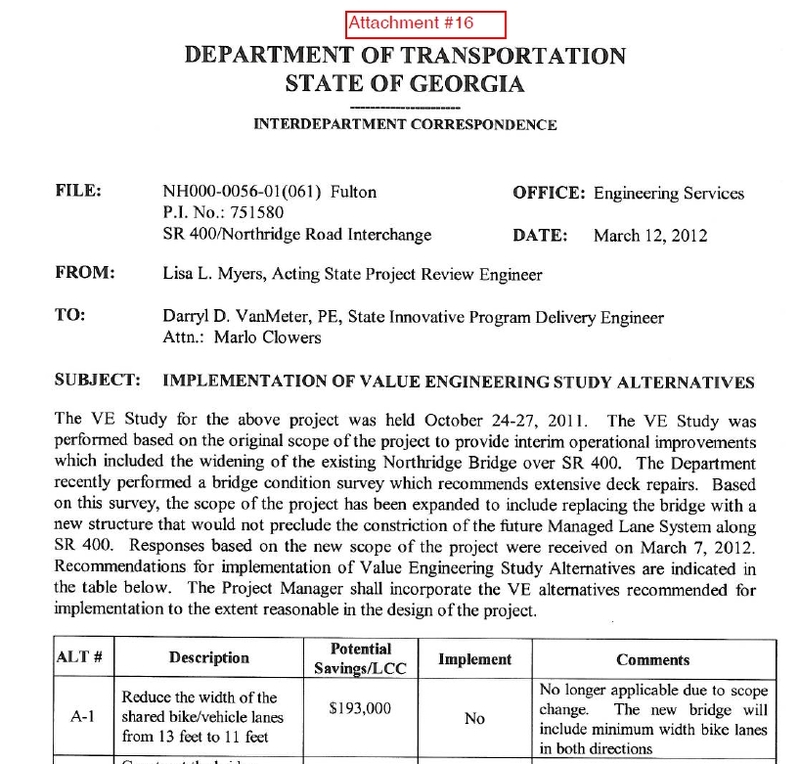 GDOT Policy: Required exception to adding Bike Lanes if increased project cost by 20% or more. GDOT Board unanimously adopted a Complete Streets policy in 2012. Bike Lanes are to be built by “default” in projects. Exception remains if 20% or greater extra cost. ARC 2007 Bike/Ped Plan: “Routine Accommodation” Bicyclists and pedestrians provided for when new roadways are constructed and for new and retrofitting existing roadways. Thank you very much for advocating for this bike path over the bridge. I just read in Sandy Springs Patch that the bike path is back in the official plans for bridge. Right now, we have bike lane in one direction so far. Working to get it in both directions AND also on the approaching roads in the project area.